The Kavanagh Group are delighted to announce a fundraising partnership with Western Care Association for 2016. It is a significant year as Western Care celebrates their 50th year in existence. Today launches a year-long fundraising drive across the four KG SuperValu Stores in Westport, Castlebar, Claremorris and Kiltimagh. 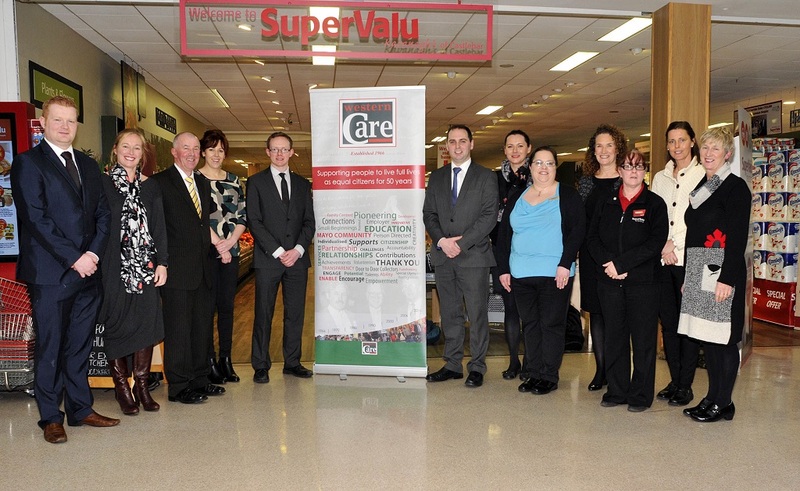 Pictured in Supervalu Castlebar at the announcement of the Kavanagh group fundraising partnership with the Western Care Association, who will be celebrating their 50th year in existence. L-r; Kevin Kelly, Store Manager Claremorris, Tia Crowley, Finance Manager Western Care, Liam Campion, Store Manager Westport, Naomi Tiernan, Development Western Care, Damien Hall, Store Manager Kiltimagh, John Page, Store Manager Castlebar, Emilia Dusinska, Assisitant Manager Westport, Sharon Reilly, HR Manager Castlebar, Fiona Farrell, HR Manager Westport, Jackie Turtill, Scanner Manager Kiltimagh, Yvonne Byrne, Supervalu Westport and Teresa Warde, Development Officer Western Care. Photo © Ken Wright Photography 2016. In the Kavanagh Group we are committed to providing our customers with the highest level of service and value right across our business. Our reputation has been built, above all, on the quality of our fresh food and the wholehearted commitment of all our employees. It is this commitment to the communities we operate in, that we are delighted to be associated with Western Care Association as a similar local community based organisation. The Kavanagh Group are looking forward to seeing the combined efforts of our staff, our customers, Western Care service users, families, friends and hopefully all those in our community as we embark on this fundraising initiative together, hoping to raise vital funds to enhance and improve the quality of life of those in our communities who are supported by Western Care. There will be a number of fundraising activities taking place over the year and we will be keeping you up-to-date with information posted on facebook, twitter etc, so please be sure to follow & stay in touch! Kavanagh Supervalu will engage with some of the existing projects that Western Care will be embarking on for 2016 with a view to maximising on what already exists along with their own projects. This is a wonderful opportunity for us to work with such professional group to raise much needed funds for Western Care"...said Teresa Ward, Development Officer, Western Care Association. Western Care have always have a fantastic response from families, friends, local businesses, employees and all our wonderful volunteers in our communities throughout the county and we are really hoping you will support this partnership and make this year a real success. Western Care is a voluntary organisation established in 1966 by parents and friends of children with a learning disability in Mayo. Today, the Association provides a wide range of services & supports to more than 1,196 children and adults with intellectual disabilities and Autism, through a network of group homes, training centres, residential homes, respite, community and home supports. We also provide a door-to-door transport service between home and our centres, and most of the vehicles used for this are wheelchair accessible.